Mayor Bill de Blasio: Thank you, Tyler, very much. Tyler, congratulations. You and your colleagues had a vision for bringing back part of our history and making it vibrant and real today. This plane speaks to – as you said – it speaks to the history of this country, the history of this city. The constellation – that’s what Connie is short for, constellation – the constellation was once one of the backbones of the American aviation industry and this plane brings us back in time and helps people experience what was. And the extraordinary TWA Terminal, which is iconic, which is one of the great symbols of New York as the cutting edge of the modern world – and that terminal was going to be really lost. Now, it’s going to be a vibrant hotel and conference space, and part of our city again. So, Tyler, to you and your team, congratulations. This is extraordinary. And I want to give a special thanks to Peter Ward who has partnered with our administration in so many ways for the good of New York City. Thank you. And I know, Peter, you’re here because you believe in good jobs and union jobs – and this extraordinary new development is going to provide thousands of them. 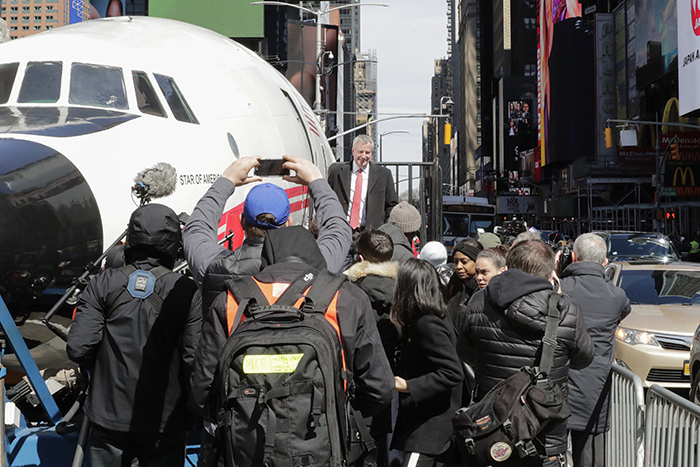 So, we should understand that New York City – you know, we were once one of the great maritime capitals and then when the age of the airplane came, we became one of the great aeronautic capitals. JFK – the busiest international passenger entry point in all of North America, right here in our city, 34 million people a year coming from abroad through JFK, 90,000 every day. The scale of it is amazing and it’s part of what makes New York City great and this helps us remember where it all began. So, we’re celebrating, today, our history. We’re celebrating the way we take our history and we build upon it. We’re celebrating what this means not only to New York City in general but to the people of Queens who are going to have all these great new jobs. We’re celebrating, for sure, 4,000 new union jobs – good paying jobs. Let’s clap for that. And when we think about our mission here in the city, it’s to get opportunity for everybody and to know now that 4,000 more families will have that great opportunity, that is really moving us forward. So, Peter, Tyler – congratulations. It’s a good day. And, everyone, come visit Connie, we’re happy to have her in Times Square. Thank you. Source: EuropaNewswire, Mayor Bill de Blasio Office.